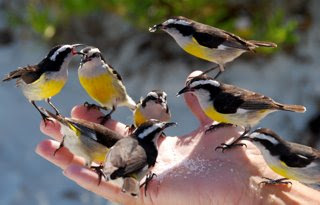 2/27/09 - A handful of birds?? My mom scolded me again when I called her yesterday morning; for the second time she told me in no uncertain terms that she did not want me to swim with the sharks again - "And I mean it!" she said emphatically. Okay, Mom, okay - I promise I won't swim with the sharks again! - at least not on purpose. I think you'll approve of what I did yesterday, though. High winds motivated us to move on to Warderick Wells, headquarters of the Exuma Land and Sea Park. It was a 3-hour trip from Shroud Cay, sailing and motor sailing. We radioed in at 9:00 to secure a mooring and were surprised to find that we were the only vessel requesting one; we got in at 12:30 and were assigned mooring number 8. The fee for moorings is $20 per night, but as members of the support fleet (we help support the park) we're entitled to two free nights. We checked in, settled in, then took the dinghy in to explore. Our first trek was over a rugged and pitted black limestone path up to Boo-Boo Hill, where people leave driftwood signs with their boats' names. From that vantage point we were treated to a superb panoramic view of the area. Returning to the beach where we left our dinghy anchored, the sight of two young women feeding birds from their hands as a young man looked on, drew our attention. We wandered over to watch and find out what they were feeding the birds. When they offered us sugar we asked if it was okay, because there are strict rules in this park and one of them is to not feed the critters. 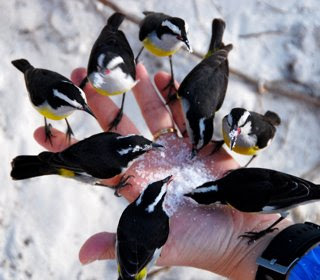 We eagerly joined in, but I later asked Judy (park manager) what kind of birds they are and confirmed that it is okay to feed them. 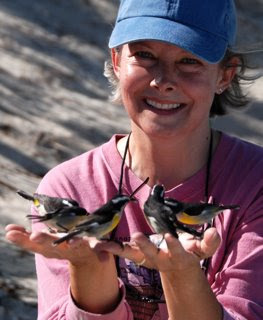 She told me they are Bananaquits (nickname: sugar bird) and yes, they are the only birds the park bird guy has given them permission to feed; there is sugar in a container outside the park office that visitors can feed to them. This afternoon we went snorkeling off Emerald Rock; what's one of the first things I see when I get in the water? A Lemon Shark. Believe it or not, as many times as I've snorkeled and scuba dived, prior to this trip I have only seen a shark once before. Sorry, Mom - I didn't do it on purpose this time. Charmed (Debbie and Craig) and Jay Sea Dee (Jodi, John, and their mini dachshund, Obie) arrived at about 10:30. When we called to welcome them, Craig suggested we all take our dinghies and explore the mangrove estuaries. It wasn't the best time to go based on the tide, but we were game. It was beautiful, like a scene from "The African Queen," although the water was only ankle deep in places and we were forced to drag the dinghies. The estuary snaked through the island and eventually took us to the most breathtaking beach on the Atlantic side. We finally got to talk to the others in person for the first time. On the way back to the boats the others suggested we get together for a game of Phase 10, so after getting cleaned up they came over to the Lena Bea. Fun game, but this was a marathon - took us 3-4 hours to finish one game. Charmed and Jay Sea Dee are headed north and we're headed south, so we bade each other safe sailing and parted ways; we'll probably meet up again somewhere, sometime. 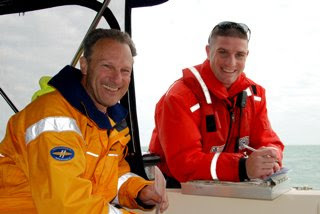 By the way, John, Craig, Captain Jim Stengel (who we met in Marathon) and another guy are taking Jay Sea Dee across the Atlantic to Portugal this spring. It will be fun to follow their blog. We intended to explore today and spend another night at Norman's Cay, but high winds and considerable waves made it too rolly where we were anchored. I had no desire to go anywhere in the dinghy in that kind of water, so with that in mind, we vowed to return to Norman's on our way north and headed down to moor at Shroud Cay, just an hour away. Cruising the Exumas is a treat because the cays are so close together - only an hour or two apart - so we don't waste time getting from one place to another. Not that sailing is a waste of time, mind you. Shroud Cay is also our first stop in the Exuma Cays Land and Sea Park. The park, which encompasses 176 square miles, is about 22 miles long and eight miles wide and is the largest protected fish-breeding ground in the Caribbean. The park has strict rules that are enforced: you cannot fish, take shells, hunt, pick vegetation, pollute the waters, or leave behind any trash. Penalties for poaching are severe. "Take only pictures and memories, leave only bubbles and footprints." The diving and snorkeling are spectacular, and at Warderick Wells (the park headquarters) they have marked walking trails and an abundance of wildlife. We expect to spend quite a bit of time in the park. Alex, do you know what the difference is between an island, a cay, and a key? Well, a cay and a key (both pronounced "key") are the same thing. "Cay" is from the Spanish word "cayo" and "key" is English (Do you remember when we went to Cayo Costa in Florida and found all those starfish?). They are small, low-lying islands, made mostly of sand, limestone, and coral, and usually surrounded by coral. Those in the Bahamas are so small that the people here often call the larger islands, such as Great Abaco, "the mainland." Interesting, huh? 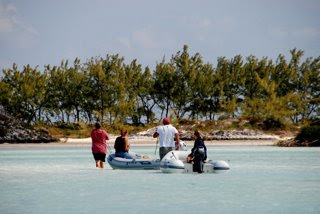 This morning before leaving Norman's Cay we were able to hail Debbie and Craig on Charmed, an IP440. They and John and Jodi, on Jay Sea Dee (an IP 485) were in Warderick Wells and headed in our direction. We hope to meet up with them tomorrow or Thursday. We met Debbie briefly at the Annapolis Boat Show in 2007, but that's it. Wayne knows them through the Island Packet email list and Debbie and I have communicated a bit through WMwaves.com since discovering we were both cruising to the Exumas this winter. The camaraderie of the Island Packet community is remarkable. I'll close my ramblings with an early "Happy Birthday" greeting to my brother-in-law, Scott. Hope you guys had a great time in Mexico. 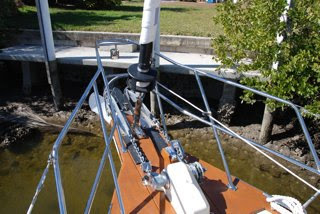 We left Highborne Cay Marina at noon on Sunday and hope to return on our way back north. 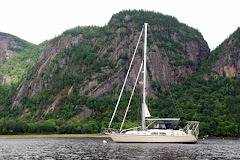 It's a lovely island with friendly people, beautiful beaches, and a well-run facility - worthy of a few days' layover whether you anchor or dock (we did both). 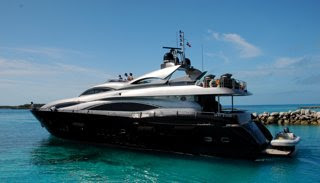 The name of this yacht is "Shadow,"but I think a more descriptive name would be "Darth Vader." Doesn't it look cool? Now we're anchored at Norman's Cay, which gained notoriety during the late '70's and early '80's as the base for a drug smuggling operation. It's peaceful today but evidence remains in the form of bullet holes in buildings at the south end and a drug smuggling plane which crashed and lies at rest in the anchorage. Today Norman's Cay is probably known more for tiny MacDuff's resort, whose bar and restaurant is reported by many to have the best hamburgers in the Exumas. We had to check it out of course, so we dinghied in at 6:00 for dinner last night. It's a cute spot with character and a roomy veranda, but probably better suited for lunch with a small group of friends - not so great for just the two of us. In fact, we were the only customers and were outnumbered by dogs by at least 2:1. It was a bit eerie... after dark, in the middle of nowhere. We each ordered a cheeseburger and a Coke and shared an order of fries for a total of $35 - a bit pricey. We don't expect to have dinner out again except socially, especially with all the provisions we have onboard. We did quite a bit of snorkeling today, mostly in search of conch for chowder or fritters. There were many enormous shells, but the meat had already been taken, as evidenced by the hole near the top of the shell. 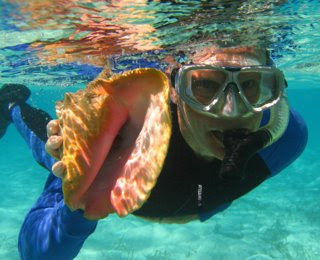 I did find one live conch, but we ended up throwing it back in since one conch wasn't enough to do anything with (Wayne's excuse for not wanting to bother with it). The highlight of our snorkeling expedition today was a Cushion Sea Star, about 14 inches across. My impression of it - after marveling at its size - was that it looked like a cushion, so I wasn't surprised to look in the book and learn its name. Tonight we did something different - settled in with a movie ("Notes On a Scandal" - I got to choose) and popcorn! 2/21/09 - Michele snorkels with sharks! After a night anchored off Highborne Cay, we decided to check in to the marina this morning, visit the beach on the Atlantic side (where it's too rough, rocky, and shallow to dinghy in), and avail ourselves of their wi-fi service for $10 a day (which seems to be the going rate down here). After our beach walk, I took Emma for a walk around the marina and down the dock. 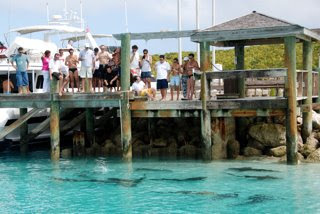 When we got to the end of the dock at the entrance to the marina, we looked in the water and were startled to see about a dozen nurse sharks swimming about and lying in the sand right below us. Of course I had to go back to the boat and get my camera. After watching and taking photos for a while, I knew I just had to do it. I had to snorkel with the sharks. I stopped at the office to ask Barbara if it would be ok. "You really want to do that? Well, people do it," she said. "Just be sure to get out of there if anyone is on the dock cleaning fish." I returned to the boat, grabbed my snorkeling stuff and underwater camera, and told Wayne what my intentions were. He followed along with the other camera, uncertain, I think, that this was a good idea. What a rush! The sharks were mildly curious and some came to check me out; one even nudged me with his nose, which freaked me out a bit and caused me to flee momentarily; I had to do this a couple times when they came much too close. I could have easily touched them. Some were about eight feet long and I was told that a couple of them were Lemon Sharks. It was an awesome experience, one I will never forget. Actually, I did it for you. This blog has been too boring and I had to come up with something to spice it up a little. After we docked, we were met at our slip by Joe, the owner of Cool Runner's Catering Service, who told us about his Saturday night all-you-can-eat buffet served right here at the marina. Except for some conch fritters, we hadn't tried any Bahamian food yet and this was a great way to do it. I can especially recommend the conch chowder - it was delicious. We dined and conversed with two couples who've been cruising together on their respective boats, and a mother and adult son who came in on an 80+ foot yacht with a staff of three. By the way, Cool Runner will deliver food right to your boat. P.S. Belated Happy Birthday, Robin! Our passage here from Nassau was lovely - sailed all the way in calm water. We heard accounts from those who left the following day who were not so lucky, as they were going into the wind and got beat up. This is our third night anchored at Allan's Cay (which includes the three cays of Allan's, SW Allan's, and Leaf) because it offers protection from just about any direction. Fronts come and go all the time down here, so wind direction is a major consideration. 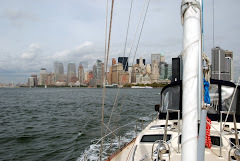 It's a pleasant anchorage and we have lots of company with about 20 other boats anchored here, including Dues Paid. We had our first beach walk yesterday morning on the Atlantic side of Leaf Cay. I found my first ever sea biscuits - four of them (only three made it back in one piece) - while wading along the shore. Leaf Cay and SW Allan's Cays are unique in that they are home to large populations of iguanas. Tour boats stop here a couple times a day and boaters who dinghy to shore are met by dozens of the creatures looking for handouts. We brought some slimy, well past its prime spinach, which the iguanas fought over and devoured in ecstasy. We had our first taste of snorkeling in the Bahamas yesterday as we and Leo took our dinghies over to Octopus's Garden, just north of Highborne Cay. There was an impressive variety of coral; we saw a ray and a trumpet fish, among other things I can never remember the names of. Our last evening here we spent happy hour with Tom and Linda from Surprise, an IP40. We also bid farewell to Dues Paid, who is headed further south more quickly than we are. 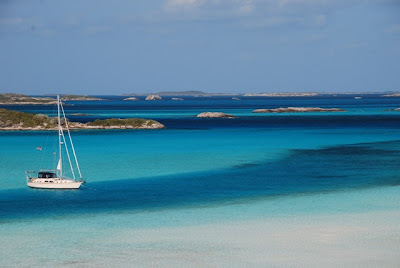 So tomorrow morning we will head for Allan's Cay, about 35 miles away. It will be our first stop in the Exumas. Alex, you may be interested to know that tonight we had beer and conch fritters at a restaurant here at the marina called The Poop Deck. I added photos to my previous posts - check them out. After Wayne finishes up dishes and I finish up here, we're going to head out to explore Nassau. Belated Happy Valentine's Day and greetings from Nassau, Alex! We love you! Hmm...So this is Nassau. Wonder if they have grass here. on a place called Paradise Island. An overheated engine is delaying our arrival in Nassau by an hour or so. Wayne dug a little sea weed out of the strainer, which didn't seem to help, then put in a new impeller. That made enough difference that we are able to use the engine on low rpms until we reach the marina, where Wayne can investigate further in the relative comfort of a dock. He suspects a clog somewhere. I thought this was a funny photo because it looks like the cruise ships are on land. The one on the left is Royal Caribbean's Majesty of the Seas, which Wayne and I cruised on many years ago. We much prefer the kind of cruising we do now. We made it and are happily docked at Nassau Yacht Haven ($2/ft. + metered electric), still with Dues Paid. Wayne checked in while I got online ($10 a day for dial-up speed wi-fi service), then we went up to the Customs Office (aka the Laundry Room). Betty and Leo stopped by for awhile, then I walked Emma until a downpour hit. 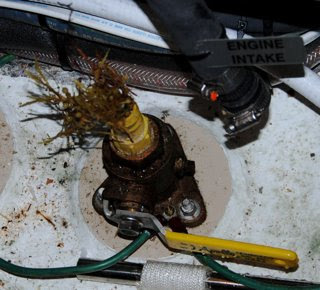 Wayne fixed the engine problem - sea weed in the engine intake through hull. After a quiet, calm, pleasant day we anchored off Chub Cay with Dues Paid and quite a few other boats. We decided to wait until Nassau to check in because it costs an extra $100 to check in here if we don't spend the night at the marina and $2.80/ft (($126) if we do. Besides that, we would have to go to the airport to do it, which is a five minute bus ride (or so they say). In Nassau they will come to our boat and it won't cost us any more than the standard $300 for a cruising permit. I am emailing these updates via our satellite phone, which has slow dialup speed of 38 kbps, too slow to even check the blog to make sure they're posting correctly. Tomorrow in Nassau we will have wi-fi so I will able to post photos, etc. Betty and Leo had us over for "attitude adjustment" and dinner this evening, which was a real treat. Happy Valentine's Day, Alex! We love you! This morning we watched as, one by one, all the other boats anchored nearby made their departures, including Leo and Betty on Dues Paid. The thought that crosses my mind is that they're all going to the Bahamas (which of course they aren't) and everyone but us knows that today is THE only day to cross the Gulf Stream. The satisfaction of getting a lot of boat stuff done today helped put us at peace with our decision to wait until tomorrow, though. Wayne cleaned sea weed out of some filters, etc., readied our fishing gear for catching The Big One on our way to the Bahamas, and is now installing some fans. I successfully made yogurt on my first attempt without a yogurt maker (Wayne likes it better than store-bought), made a few phone calls, did a little cleaning, reorganized some things, etc. I best deal with stress by over-preparing (guess it gives me the illusion of control) and I have to admit feeling a fair amount of trepidation over our crossing and passage to the Exumas. We left Boot Key in Marathon at about 4:30 a.m. to time our arrival at Pumpkin Key at the north end of Key Largo for late afternoon. Motor-sailing into the waves made it not so comfortable to start with, but after turning north we had a lovely afternoon sail. Midday I was down below when Wayne yelled to me, "Hey, I think that's another Island Packet 445! I'll bet it's Gail C." As they passed us from the opposite direction we caught the name of their boat, and it was indeed them. We met Frank and Gail two years ago - after we bought Lena Bea but before we commissioned her. 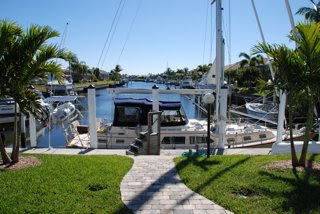 Frank and Gail had Gail C. docked at Burnt Store Marina (which is in Punta Gorda) and invited us over so we could see how they had done things, where and how they had installed various equipment, etc., which helped Wayne a great deal. We knew they left for the Bahamas in January so were very surprised to see them. Wayne called them on the VHF and we learned that they had waited 18 days to cross the Gulf Stream and finally had to turn back due to a family matter. We think it was an unplanned family matter in their case, but cruisers with deadlines or schedules frequently have to cancel their trips when that ubiquitous weather-window just doesn't come along in time. The Gulf Stream is like a river in the middle of the ocean and it flows north at about 2.5-3 knots. When there are winds from any northerly direction, crossing can be miserable (depending on how strong they are) and even treacherous because the wind and current work against each other causing large, turbulent waves. After the wind changes to a favorable direction it takes a day or two for the seas to calm down enough for a comfortable crossing, which is why we'll probably wait until Friday. We were cruising along, happy as clams, until we reached the entrance to Angelfish Creek. Some of you already know what I'm going to say, don't you? Yep, we ran aground. I fixed dinner and we ate while waiting an hour and a half for the tide to come up enough to get off the rocks, then waited another 45 minutes for good measure. Some people think Wayne never gets angry, but those folks have never been with him when he ran aground. I'll let Wayne fill you in on the details for the sake of accuracy, but basically he was looking at tide tables that had conflicting information. Leo and Betty had called to let us know the tide was unusually low due to the full moon and that we should probably wait until high tide to come in (they were already anchored at the other end). Wayne checked tide tables and charts again and called Captain Jim to get his input. Boaters entering the channel ahead of us didn't think we'd have a problem (note to selves: don't trust depth sounders on other boats to give the same readings as ours). We turned left when we reached Card Sound just before sunset and I grabbed the binoculars to look for Dues Paid - Leo and Betty's catamaran - so we could anchor near them. As I looked around the anchorage at boat names, I noticed several boaters with THEIR binoculars trained on US. Guess they wanted to see who the poor suckers were who ran aground. As the saying goes, there are two kinds of boaters: those who have run aground and those who will. So they either have been or will be some day, in the same boat (so to speak). We couldn't find Leo and Betty and finally had to call them to ask where they were anchored, and found out we should have turned right instead of left when we reached the sound. Oh well. 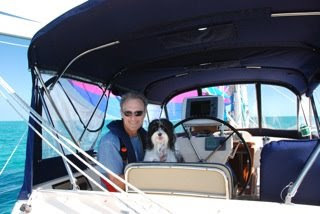 As we were preparing to anchor and I was finishing up with Betty, someone called us on the VHF. It was a nearby sailboat, Brilliant, and they invited us over to share a bottle of wine. We agreed before thinking it through, then called back and pleaded exhaustion - getting up at 4 a.m., sailing all day, and sitting sideways in the channel for two hours will do that to you. I'm sure it would have been interesting to visit with the folks on Brilliant, though - they've spent the past seven years living on their boat. Besides - had we not been so tired, we would have liked to get together with Leo and Betty. 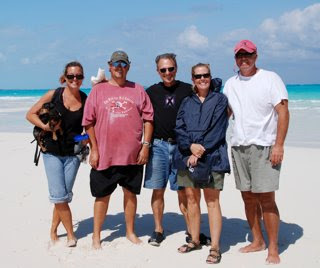 A couple from the Mariners of PGI, our boating club, put us in touch with them a couple weeks ago because Leo and Betty (neighbors of theirs) were planning to leave for the Exumas about the same time we were. Betty and Leo have cruised to the Bahamas 8-10 times and have shared lots of information with us; they and Wayne spoke on the phone many times, but we haven't met them yet. 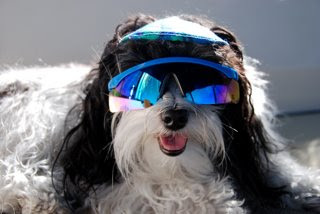 It looks like our meeting will have to wait longer because they are leaving for the Bahamas tomorrow and we've decided to wait until Friday and the slight possibility of a calmer crossing. We agonized over this and Wayne spent hours poring over wind and wave charts before deciding. The group from Boot Key is leaving on Friday (from Rodriguez Key), as are others we've talked to, so it's probably a toss-up and we'll be more ready after a day at anchor anyway. 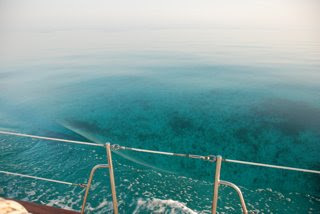 After a quiet, calm, pleasant day we anchored off Chub Cay with Dues Paid and quite a few other boats. We decided to wait until Nassau to check in because it costs an extra $100 to check in here if we don't spend the night at the marina and $2.80/ft (($126) if we do. Besides that, we would have to go to the airport to do it, which is a five minute bus ride (or so they say). We plan to stop in Nassau anyway. Immigration will come to our boat and it won't cost us any more than the standard $300 for a cruising permit. 2/13/09 - Are we almost there yet? I didn't expect to spend the first few hours of our crossing on my hands and knees scrubbing the floors and cleaning the cabin, but there I was. Crossing the Gulf stream was a piece of cake, even with north-northwesterly winds at about 10-13 knots. We had an occasional one-foot wave, but it was as calm as we could have hoped for. We left our anchorage at 6:30 and passed between Gun and Cat Cays (pronounced "keys") at 2:00. 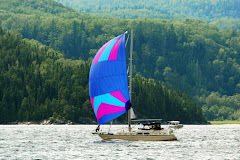 We motored all the way with help from our sails. It feels like a different world over here - "I don't think we're in Florida any more, Emma!" Crystal clear waters of turquoise and azure welcomed us, and I was mesmerized by the white, sandy bottom of the ocean, dotted with bits of grass and countless starfish. It was very warm and I could hardly wait to get in the water. We were in radio contact with Leo and Betty, who had checked in and spent last night in Bimini. We motored another ten miles or so and anchored next to them along the banks. After calling them with an invitation to come over, we put on our swimsuits and snorkel gear. I immersed the bottom third of my body in the water and changed my mind. We hadn't taken the time to don our wetsuits and the water was too darn cold - about 76 degrees. Tomorrow we'll probably check in at Chub Cay, anchor there for the night, and continue on to Nassau. We traveled about 70 miles today from Key Largo, but have another 110 miles or so to reach Nassau. We haven't had Internet service the past couple days - I'm emailing this from my cell phone - but will post updates the next opportunity. And that will be from the Bahamas, because we're leaving in the morning. Yea! The satisfaction of getting a lot of boat stuff done today helped put us at peace with our decision to wait until tomorrow, though. Wayne cleaned sea weed out of some strainers, etc., readied our fishing gear for catching The Big One on our way to the Bahamas, and is now installing some fans. I successfully made yogurt on my first attempt without a yogurt maker (Wayne likes it better than store-bought), made a few phone calls, did a little cleaning, reorganized some things, etc. I best deal with stress by over-preparing (guess it gives me the illusion of control) and I have to admit feeling a fair amount of trepidation over our crossing and passage to the Exumas. This morning we moved from the marina back to our anchorage for a third night at Marathon. A group of Bahamas-bound cruisers was meeting to plan their crossing, so Wayne took the dinghy in to the City Marina to join them. We have these great little gadgets on our life jackets - a LifeTag system - that set off alarms on the boat if we get a certain distance away. That's so we'll be alerted in case one of us falls off without the other knowing it. It's a horrible, shrieking alarm, and guess what? Wayne forgot to take his LifeTag off before he left in the dinghy. I frantically tried to figure out how to turn off the alarm, but to no avail. I tried to call Wayne on his cell, but it was in a waterproof bag in the backpack and there was no way he could hear it over the sound of the outboard. I left a message ("The LifeTag works really well, but you can turn it off now," with appropriate sound effects in case he needed proof). Finally I retreated to the bedroom where Emma was already hiding out, closed the door and - hey! - I have ear plugs! I finally reached Wayne half an hour later and he told me how to turn the darn thing off - push the same button I had been pushing, but hold it down for five seconds. If you were on one of the many boats anchored around us today, we send our most embarrassed apologies. This morning after a peaceful night at anchor, we went in to Marathon Marina (where we're spending the night) because Wayne was expecting a visitor. We were met at the fuel dock by John and Chuck, two marina residents. Being here afforded me the opportunity to get online, so I have been busy tweaking my posts and uploading photos, as you may have noticed. The blog for this trip will be quite different from the previous one because it's a totally different kind of trip and the audience is more diverse. On the trip from Lake Superior we traveled about 5000 miles in 109 days, so we were moving constantly and there were many destinations to write about. Our trip to the Bahamas will be more like an extended vacation. The blog from 2007 was written as a simple way to keep friends and family abreast of our journey. 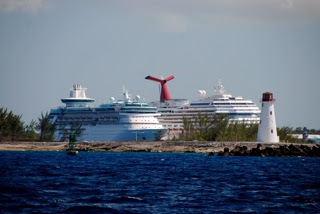 Very few of them were cruisers, but this time around it's a different story - some people reading this blog have cruised to the Bahamas (and much farther) many times. I expect the diversity of my readers this time around to make writing the blog more challenging. At this point I need to pause and thank other cruisers who have so generously shared their wisdom and experiences with us, which will help us enjoy a safer and richer trip. To them - and you know who you are - we send our heartfelt thanks. And I might as well 'fess up right now to the fact that I am nautically challenged because it won't take you long to figure it out. During the last trip someone asked me early on what my objectives or goals were for the trip. I think my response was that I just wanted to make it all the way to Punta Gorda without abandoning Wayne. My objectives for this trip are to 1) soak up the beauty and splendor of God's creation., 2) scuba dive and snorkel, 3) do some decent underwater photography, 4) take lots of long walks on as many beaches as possible with Wayne and Emma, 5) collect shells, 6) enjoy the fellowship of other cruisers and native Bahamians, 7) eat all our citrus fruit before any spoils, and 8) read - if I have time. I probably won't have the ability to post to the blog as frequently as I did last time. The Exumas are quite remote and internet access isn't widely available. That said, we do have a satellite phone with a very slow (think slow dial-up) data connection, which I will attempt to use to email my blog posts. By popular demand, I plan to post lots of photos, but they might need to be added later when I have high speed internet access. We'll see how it goes. Last night at Little Shark River there was another Island Packet - Kismet - anchored near us and Wayne called them on the radio this morning. 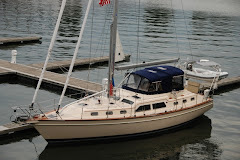 Jim and Lori had recognized the name of our boat because they read our blog! We could hardly have asked for a finer day of sailing: winds 15-20 knots off the beam the entire day. We never get tired of visits by dolphins. We're anchored off Marathon in the Keys tonight. 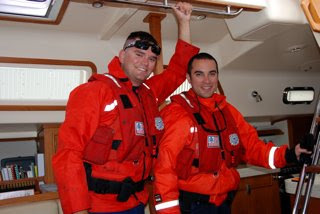 A quick update for those of you who were with us on our previous trip in '07: After we arrived in Punta Gorda on November 12, I wasn't interested in going anywhere on the boat for several months and was content to entertain lots of company that winter. We had planned to go for a couple weeks last spring, but I had rotator cuff surgery the end of March and my right arm in a sling for four weeks, followed by months of physical therapy. So much for those plans. After summer at home in Minnesota, we returned to Punta Gorda the end of September. On November 13 - a year and a day after our arrival in Punta Gorda - we left on a nine-day cruise to the Dry Tortugas, a national park about 70 miles west of Key West. By then we were so ready to go again. 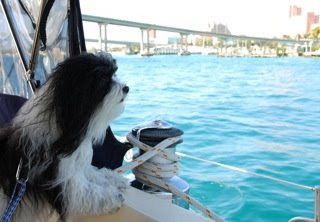 We also needed to initiate our new crew member, Emma - a Havanese puppy who was born Oct. 12, 2007 - in preparation for our trip to the Bahamas. Before heading out for a couple months, we needed to know that she would adapt to the cruising lifestyle. And we needed to figure out the potty thing for when we're away from land for days at a time, which can be a very big deal for boaters and their dogs. Our solution was to teach her to go on one of those synthetic chamois cloths, which we put in the forward shower. The first 48 hours were agony for all of us (we had no idea she could hold it so long), but Emma got the hang of it and now sits at the bathroom door when she has the urge. It works very well; we just flush what is flushable and wash out the cloths. 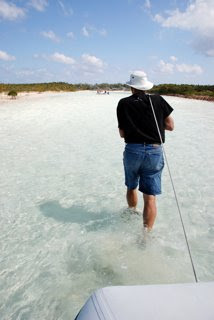 By the way, our trip to Dry Tortugas National Park was great and we will return. The weather could have been better, but we managed to get in some decent snorkeling, toured Fort Jefferson - which was historical, interesting, and photogenic - and spent time with some very nice people... from Punta Gorda (hi Nancy, Steve, Laurie, and Paul). If you're not familiar with the Dry Tortugas, I'd encourage you to read more about the park online. You can check out my photos of the trip at http://gallery.me.com/mrmsharp/100045. Last night we anchored in 23 feet of water about fifteen miles west of Everglades City and a couple miles south of Cape Romano Shoals. After years of sailing in Lake Superior, which is hundreds of feet deep, I'm always amazed at how shallow it is around here. Within minutes of setting out this morning we crossed paths with a Coast Guard cutter and knew instinctively that we were about to be boarded for the first time. 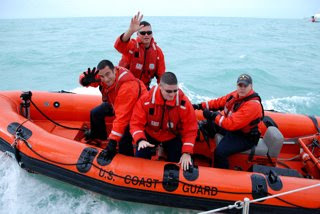 For those who don't know, the Coast Guard can board any vessel at any time to make sure we're in compliance with safety regulations and have U.S. Coast Guard required equipment on board. Wayne is a member of the Coast Guard Auxiliary and they do the same safety inspections (but strictly voluntary), so we passed with flying colors (we even had a trash management plan, which few boaters have - ours was the first boat these guys had seen that had one). 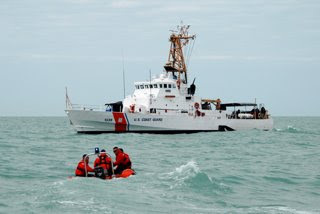 By the way, the Coast Guard Auxiliary does everything the Coast Guard does except for law enforcement. Tonight we're anchored at Little Shark River, which leads into the Everglades. As I write I'm distracted by dolphins frolicking in the late afternoon sun and pelicans diving for their dinner. Our delayed departure on Thursday was a blessing because I don't think we could have been ready to leave any earlier than we did. Oh, we would have rushed and left anyway, but I wouldn't have felt good about it. We were able to get things well organized and really took the time to make sure we weren't forgetting anything. I have so much food! But provisions are more expensive in the Bahamas and besides, I don't want to spend time grocery shopping except to pick up an item or two here or there. We have powdered milk and I will bake bread and make yogurt. The frig is well-stocked, my freezer is packed to the brim, and I have canned goods galore. Oh, and dozens of grapefruit, oranges, and lemons. We have one tree of each and I went on a fruit-picking rampage before we left. These two sailors will NOT get scurvy, no siree! We anchored at 9:30 p.m. near Alligator Creek. We were warm and cozy sleeping, although there were freeze warnings out for as far south as Fort Myers (I don't know if it ever got that cold on our trip from up north). Wayne knew the only way he was going to get me up at 6:00 was to crank up the furnace. We're counting on more natural heat in the Exumas (southern Bahamas). Right now it's noon and we're south of Sanibel. It's 7:57 p.m. and we're leaving the dock. Will anchor close in tonight.